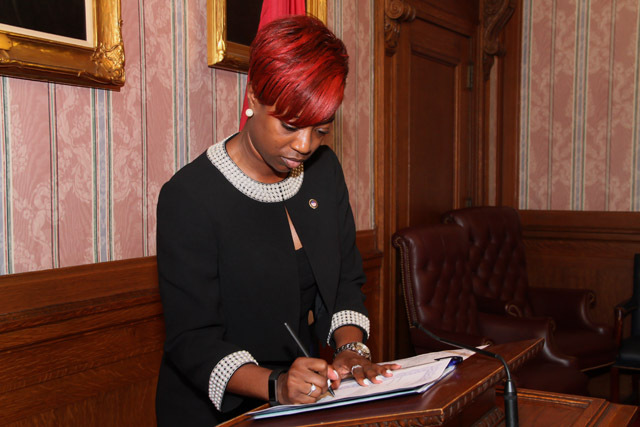 Today, Mayor Frank G. Jackson swore-in Nycole D. West as the City of Cleveland’s Director of the Department of Human Resources. Director West joined the Department of Human Resources in 2002 and has served various roles throughout the Department during her career with the city. Director West specializes in labor and employee relations and currently serves as the Department of Human Resources Chief Negotiator for each of the city’s 31 labor unions. During her tenure, she can best be described as a catalyst for progressive change and a promoter of productive relationships. Director West’s accomplishments include implementing a city-wide performance management program, centralizing and automating the Family Medical Leave Act (FMLA) process, establishing accountability through a city-wide disciplinary committee and fostering a safer workplace through post-accident drug testing policies and procedures. Director West is a native of Cleveland, Ohio and is currently enrolled in the Master of Legal Studies Program at Cleveland State University with an anticipated graduation date of May 2017. She obtained her Bachelor’s degree from Duquesne University in Pittsburgh, Pennsylvania and is a graduate of the Cleveland Management Academy through Cleveland State University. Director West is an active member Alpha Kappa Alpha Sorority Incorporated and Cleveland Society for Human Resource Management.